Thirteen year old Brian is the only survivor of a plane crash in the Canadian wilderness. Armed with the hatchet his mother gave him before he left on this trip to see his father, Brian is faced with surviving in a harsh world where there is no one to hand him food, shelter or safety. Brian slowly solves one problem after another and makes some mistakes along the way. Can he survive? As he creates his new world, he spends time sorting through his parents' divorce. This is a great read for boys who look for adventure and who understand that as they grow into men, they will need to figure out the questions and the answers for themselves. A great coming of age/survival/wilderness story. Several sequels follow-Brian's Winter, Brian's Return and The River. This book is awsome I read the book five times. This book is about when Brian a 16 year old boy went on a plane to see his dad but then his pilot had a heart attack and died. Read the book to find out what Brian is going to do. This book is for people who like adventure and survival. 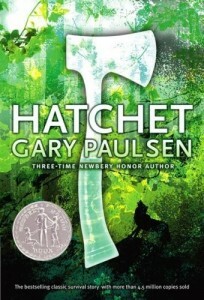 Hatchet is about a boy named Brian whose parents are divorced. When Brian goes to visit his dad on his own in small a plane with only himself and a pilot, not everything goes as planned. In the middle of the flight, the pilot has a heart attack. Brian is forced to try to fly the plane! This book is a great book, because you never know what is going to happen next. 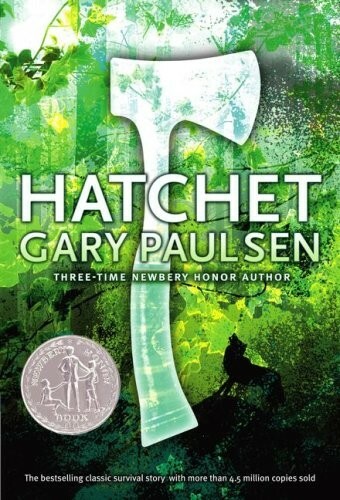 This book is very adventurous, and if you want to find out what happens to Brian, you should read Hatchet.